Katinka Kleijn will be performing with the MISO and musimelange in May 2012. Ms. Kleijn has been a member of the Chicago Symphony Orchestra since 1995. Her list of solo credits includes appearances with the Chicago Symphony Orchestra at youth concerts; The Hague Philharmonic Orchestra; the Chicago Sinfonietta; the symphony orchestras of Elmhurst, Sheboygan, DuPage and Indian Hill; the Highland Park Strings; the New Millennium Orchestra; and the Illinois Philharmonic. Kleijn also appeared at the Marlboro Music Festival, on the Ravinia Festival’s Rising Star Series, and on Dutch National Radio. a few moments of life shred through the eyes of a dear friend. Even though I’m a nurse, a trip to the hospital still brings unease to the heart. 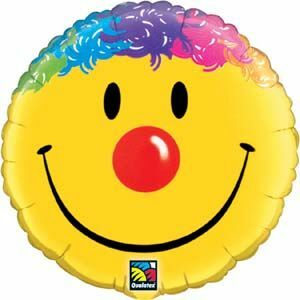 You don’t know what will happen, and let’s be honest, the fear of the unknown is always present, until I glanced up to the ceiling of my hospital room, I saw a happy face clown balloon smiling down at me. 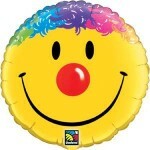 He has a gold face, multicolored hat, cute black eyes, the appropriate red nose and a special grin. Every day it was great to see that happy face grinning down at me – made procedures a little easier. For two weeks I enjoyed having my friend, Fred. To my pleasant surprise the day before I left the hospital, Fred had floated down to my bed. We were fated to be friends. After being moved to rehab, I taped Fred to the wall beside my bed. That happy face helps my mind, body and soul heal. We all have to deal with trauma of all kinds but I wish for you a Fred. Amazing such an inanimate object can bring such joy. What music does your life make? An evening of effortless elegance filled with wine, music, culinary adventures and fashion awaits! Click on the envelop icon below to email us. *You can visit our Facebook page to see our photo albums by our featured photographer Carrie Feit. Eduardo Marturet enjoys an active career on three continents. As the Music Director and Conductor of The Miami Symphony Orchestra, he remains deeply involved in the musical life of his native Venezuela and continues to guest conduct actively in Europe. He has made more than 40 CDs that range from a Brahms orchestral cycle to surveys of Latin America’s greatest orchestral composers. European orchestras with which he has had an active guest conducting relationship include Berliner Symphoniker, European Community Chamber Orchestra, Staatsphilharmonie Rheinland-Pfalz, RAI Symphony Orchestra, Danish Radio Symphony, Royal Flemish Philarmonique, Nordwestdeutsche Philharmonie, Gelders Orkest, Bohemian Chamber Philharmonic, Budapest Radio Symphony, Brabant Orkest, and Concertgebouw Chamber Orchestra in Amsterdam. In 2001, he led the Berliner Symphoniker on a 12-concert tour of major South American cities including Caracas, Sao Paulo, Cordoba, Montevideo and Buenos Aires. A documentary of the tour was broadcast through the region by DirecTV. Born in Caracas, Marturet studied in Cambridge, England where he became firmly rooted in the European tradition, obtaining a degree in Piano, Percussion, Conducting, and Composition. In 1979, he returned to Venezuela with a permanent position with the Orquesta Filarmónica de Caracas as Associate Conductor and later as Artistic Director to the Orquesta Sinfónica Venezuela, where he served in that position until 1995. Presently, he maintains close contact with the Venezuelan National Youth Orchestra movement, giving advice and support in aid of poor children. With the opening of the Teresa Carreño Theatre in Caracas in 1984, Marturet became its first Music Director. After three years of bringing challenging and original productions to the stage, he resigned from the Theatre to dedicate himself entirely to an international career, conducting in Italy, Greece, France, Spain, England, Denmark, Holland, Korea, Norway, Sweden, Germany, Czechoslovakia, Belgium, Canada and the United States. He made his Asian debut with the Seoul Philharmonic in 2003, a year when he also opened the Chorin Summer Festival in Berlin and made his debut with the Buenos Aires Philharmonic in Argentina and the Florida Philharmonic in Miami. In 2006, Marturet received a Latin Grammy nomination for “Encantamento” in the category of Best Classical Album conducting the Berliner Symphoniker. At 34, Paris born Sébastien Verrier is often younger than some of the wines he serves. However, his youth has not prevented him from garnering a stellar reputation as a sommelier, one who relishes in the “always learning, always tasting, always working on the palate” associated with his profession. It is a profession he entered when he was only 15 as a sommelier’s assistant at Paris’s Michelin-starred Les Clos Longchamps. Verrier balanced his duties there with earning a bachelor degree in wine stewardship. Having begun to master wine, he became equally determined to learn English, so after two years as second sommelier at the famed Michelin one-star Le Jardin in Paris, he headed for London and a position as captain/sommelier at Mon Plaisir Restaurant. Wanderlust, which often accompanies wine expertise because of its global nature, had set in by 1998. Verrier set his sights on New York City, where he spent a year as a captain at Les Trois Jeans before taking off for Australia and an exploration of its viniculture. Verrier joined the Biltmore team in the fall of 1999 where he oversaw the wine lists at La Palme d’Or and the 1200 Restaurant & Courtyard, as well as wine pairings for all the hotel’s winemaker-theme dinners. After 12 years at the Biltmore, he became a partner of W Wine Boutique in January 2011. ACT • a wine tasting or any kind of national drink you’d like to taste (vodka, tequila, whisky etc…). 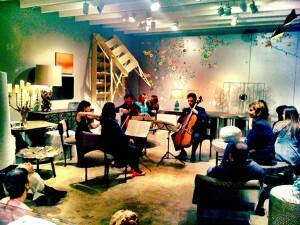 ACT • a brief concert of chamber music (Sonata, Trio, Quartet etc…) with or without piano. ACT • a time for gourmet delights. If you have a concept in mind, great! If not, we can work with you to create a unique and unforgettable evening that will be the talk of the town. We will be glad to sit down with you and craft Ur musimelange experience into an elegant affair. The evening begins as you enter the home of a dear friend to encounter a professional sommelier who can walk you through the beguiling subtleties that await your palate, and can respond with suggestions for other vintages you may enjoy so that you can build your own champagne collection. The host then invites you to retire to the salon, introducing you to world-class musicians who have prepared an intimate concert of chamber music just for you. Using the champagne as inspiration, they perform a concert of effervescent music that delights and uplifts your spirt. Since there is no stage, the musicians interact with you, responding to your questions and desires, causing you to experience music in a way that you never before thought possible. Like every vintage of champagne differs one from another, each performance of a fine piece of music has a different interpretation; the musicians will share their approach and make you a part of it. A wonderful concert, but your glass is empty! The charming and knowledgable sommelier comes to the rescue, refilling it with your favorite bubbly of the evening. Thanks to scrumptious hors d’oeuvres prepared to enhance and complement your champagne, you’ve left your cares behind and can simply enjoy the company of your closest friends; the end of an evening that you’re sure to remember for a long time.